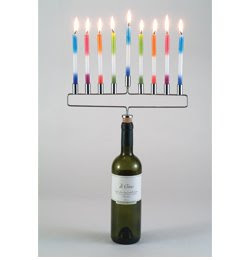 PopJudaica.com is celebrating Chanukah with 8 Days of Giveaways! Each day this week, we'll be gifting one lucky blog reader with a special Chanukah gift. Enter to win the Menorah Cork by telling us about your favorite holiday beverage! (It can be alcoholic, non-alcoholic - whatever gets you in to the holiday spirit. You can even share cocktail recipes!) Let us know your drink of choice in the comments section below by Midnight PT tonight 12/22/09. Hot Chocolate (as opposed to hot cocoa) with little marshmellows in a mug that my son made for me one Chanukah. And whipped cream too! Year round, my favorite is the vodka gimlet, made with Rose’s lime juice (now with an OU hecksher!). i only drink classy wines. and nothing says classy like manischewitz! I know someone else already said this, but nothing beats spiced apple cider. It tastes good with everyone’s holiday — it’s a great compliment to Thankgiving turkey & all those cranberries; it’s delish with Christmas ham (not that I’d know! ;)) and it’s clearly a winner at Chaunkah — if applesauce is latke lovers’ condiment of choice, then a hot apple drink surely pleases the palette, too. YUMMM. Fun question. Love reading everyone’s answers! I know it’s cheesy, but I like to put hot chocolate with marshmallows mix in my ‘Chai Maintenance’ travel mug, fill it up most of the way with coffee, add some peppermint-flavored non-dairy creamer (for us lactose intolerant types)…. Hot chocolate with a splash of Bailey’s and whipped cream. Only after a milchig meal, of course! My favorite holiday beverage is hot spiced cider. My comment was supposed to say hot apple cider with spices Please disregard the other one with typos.